Ok so this is always an area of skincare that I find a lot of clients forget about! But its the worst one to neglect! SPF is so important! Wear An SPF (full stop)!! Hate to sound bossy or blunt but without wearing an SPF daily your going to experience premature ageing way before you hit 30years old! Sun damage & skin cancer can occur without burning. Wearing a high protection broad spectrum sunscreen is essential year round. Even on cloudy days UV rays are causing long term damage. Look for the UVA symbol alongside the SPF value on your sun protection product. Research confirms that SPF does not prevent Vitamin D production. Stay safe whilst outdoors and keep up with the sunscreen. Cancer charities recommend applying 30 minutes prior to exposure to maximise protection. There are two main types of sunscreen. Chemical sunscreens absorb into the skin and turn the UV light energy into heat energy. Suitable for most skins. Physical sunscreens are mineral based and bounce the light off the skin surface due to their reflective quality. Great for sensitive skins. your skin the ultimate in UV defence. For maximum potency and shielding, super Smart Boosters release the vital vitamins only during direct exposure. 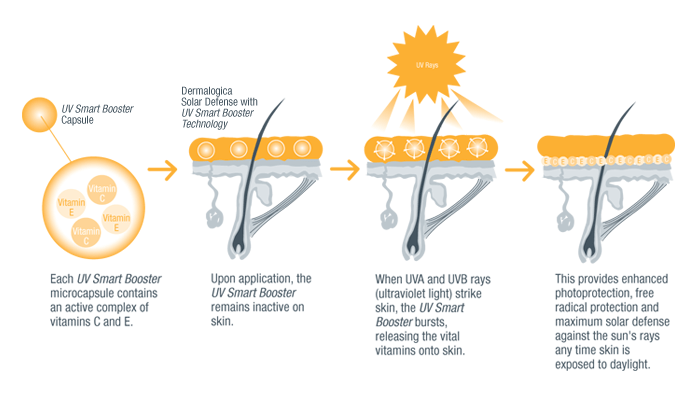 UVA rays account for up to 95 percent of the UV radiation reaching the Earth’s surface. They are present with relatively equal intensity during all daylight hours throughout the year, and can penetrate clouds and glass. They are also largely responsible for premature ageing and research shows may initiate skin cancer. Most people do not apply enough sunscreen! on packaging you must use approximately two tablespoons for the whole body. A dab of your foundation with in built SPF just won’t cut the mustard. I hope this has made you slap your SPF on your face and body! Also don’t forget your ears!